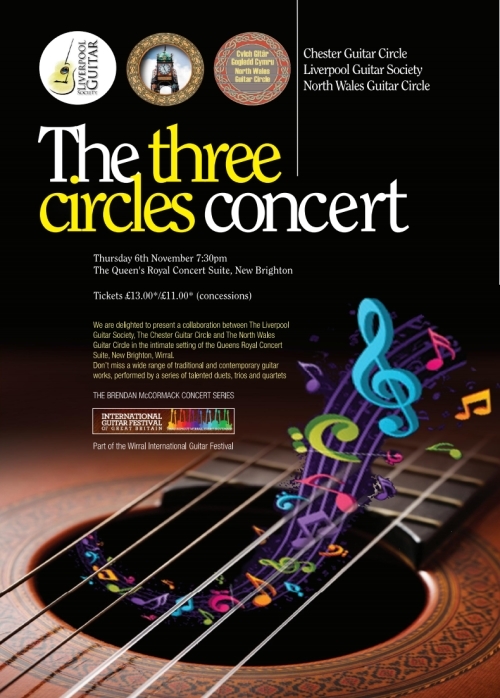 In November we have a concert booked at The Queens Royal Hotel, New Brighton as part of the International Guitar Festival of Great Britain which will feature a quartet from Liverpool Guitar Society, alongside a duo, trio and quartet from Chester Guitar Circle and a duo from North Wales Guitar Circle. Tickets are £13.00 / £11.00. The sets will feature nearly all new pieces we’ve not played before at the festival; with repertoire ranging across the centuries from Bach, Faure and Debussy; to Peter Warlock (http://en.wikipedia.org/wiki/Peter_Warlock), American Andrew York of Los Angeles Guitar Quartet fame (http://en.wikipedia.org/wiki/Andrew_York_(guitarist)) , and Liverpool composers Lennon / McCartney and Mark Houghton (http://www.chesterguitarcircle.co.uk/mark-houghton.html)! Other classical guitar events at the festival include highly acclaimed British born classical guitarist Alison Smith also at The Queens Royal, New Brighton on Friday 7th November 7:30pm and Craig Ogden performing Rodrigo’s Concerto de Aranjuez with the Liverpool Mozart Orchestra at the Floral Pavillion on Saturday 15th November, 7:30pm.